Do hot sun, cold drinks, warm sand, and cool ocean waters sound like the perfect ingredients for your next family vacation? If so, think Mexico. Mexico is filled with beauty; each new place, even more, inviting and appealing the last. Whether you are looking to enjoy days of peace and solitude with a book on the beach, or you want to take your family on a vacation whose memories will last a lifetime, there is no better place than this scenic country. The people of Mexico are warm and friendly, and they are always ready to help out-of-town guests navigate their way through days filled with fun and surprises. If that alone is not enough to persuade you to give Mexico a try, perhaps our account of some of the best places to travel in Mexico will do the trick. Get ready for your adventure! Puerto Vallarta – Living is Believing! Puerto Vallarta is a magic-filled city; there truly is something for everyone. Living each day of your vacation brings that magic to life. Love the nightlife? You can enjoy outdoor parties, nightclubs or raves hosted by internationally acclaimed DJs. Sip your favorite cold beverage, listen to some great tunes and watch the amazingly colorful world go by, or dance the night away with your friends. Don’t plan to sleep in the next day, though; there is just too much to do! Revel in the sun-drenched days by strolling the Malecon boardwalk where “The Boy on the Seahorse”, the iconic statue known simply as “The Seahorse Statue,” is strategically located halfway down the Malecon by Galeana Street. Window shop down the cobblestone streets of Old Vallarta or pick up handmade crafts at the flea market. The Bay of Banderas is the perfect location when you need some ‘incommunicado’ time. You can take a dive in its calm and cool waters, or you can just laze around and watch the artists sculpt their most spectacular creations using the sand as their canvas. The Conchas Chinas beach, meaning “Chinese Shells,” is just minutes away from the city and is one of the most secluded and beautiful beaches in Puerto Vallarta. Its unique blue-green waters bank against the horizon and beige sands are picturesque and poignant, reflecting the reason this is at the top of the list of best cities to view in Mexico. El Centro offers a selection of fine art galleries where you can schedule a self-guided tour of the art and paintings. The Parish Church of Our Lady of Guadalupe has tour guides that offer insight into the history and facts of the church and Mexican traditions. The best time to visit is in December during the 12-day Feast of Guadalupe Festival. Don’t forget to make time to breathe in the fairy-like magic of The Vallarta Botanical Gardens. Off the beaten path, the botanical gardens offer a day of sight, scent, and wonder that will satiate the senses. Enjoy a swim in the small river running through the property, a stroll around the orchid gardens or a quick meal at Hacienda de Oro, one of the finest restaurants featuring local, delicious cuisine. Experience the wonder and beauty of Puerto Vallarta from Casa Guillermo, the visually striking, twelve bedroom luxury villa. Comfortably situated along the Conchas Chinas Beach on Banderas Bay, visitors will be awed by the contrast between the natural beauty of water shaped geological formations against the backdrop of a posh, multi-million dollar neighborhood. All of this can be viewed from the encircling floor-to-ceiling sliding glass doors of the main living area, or the spectacular terraces while the full-time eight-person staff attends to the every need of their guests. Replete with all the amenities even the most modern of hearts could desire; the Casa Guillermo can function as an isolationists’ haven, or a stylish contemporary getaway. Known as a coastal resort town, Playa del Carmen is a more laid back Mexican retreat and is one of the top diving destinations in the world, thanks to its beautiful and abundant sea life and underwater caverns. Once a fishing village, this stylish town boasts just as much fun and beauty on dry land as well: live music on the beach, a huge variety of entertainment venues, and beaches like you’ve never seen before. What makes Playa del Carmen one of the best towns to visit in Mexico is that nightclubs, restaurants, bars and souvenir shops are right on the beach and are open at all hours. You can enjoy a day at the beach and other exciting activities all in the same gorgeous location. The tropical sunset makes it the perfect place for those who want to relax. Fonda Regina, one of the Playa del Carmen’s most popular restaurants, features handmade food like tortillas, the “artisan” bacon, the weekly cochinita (pork) served every Sunday, and fresh salsa prepared right at the table. You cannot leave this city known for its food without partaking in these scrumptious delights. Playa del Carmen has amazing dive spots that are teeming with diverse marine life, but it is best known for the unique experience of diving the many diverse cenotes – natural caves filled with crystal-clear fresh water. You will have a magical time exploring and diving in these breathtaking natural formations. This town is the ultimate diver’s paradise and the best city in Mexico to explore the mystical world beneath its turquoise waters. Picking a luxury vacation home in one of Mexico’s most popular destinations is a daunting challenge. But, most luxury travelers would agree that the nine-bedroom, 6,000 square foot Casa Yardena is at the top of the list. Complete with four guest homes, a gargantuan swimming pool, marble bathrooms, authentic Spanish archways, and a private beach, exemplifies the very height of luxury. Punta Mita means ‘Gateway to Paradise’ and this beautiful beachfront village located on Banderas Bay in Nayarit is true to its name. Just ten miles north of Puerto Vallarta, it has a pleasant and comfortable climate throughout the year and is one of the top tourist destinations in Mexico. If you are looking for a place away from the party scene or if you’re on a spiritual quest, this is the place for you. With two Jack Nicklaus golf courses, multi-million dollar villas, and well-known high-end hotels, Punta Mita has evolved into an exclusive luxury community. This paradise beach offers a tropical vacation feel. After all, it is located on the same latitude as Hawaii. Aramark serves fresh-caught local fish cooked with an Asian twist for a unique flavor. Another popular favorite is El Dorado, one of the oldest restaurants in the village where authentic Mexican seafood graces the menu. Migratory and indigenous bird sightings are just a few of the species you will capture in Mexico’s diverse ecosystem. If you visit from December to March, you can witness the amazing annual winter migration of humpback whales. You can also see a kaleidoscope of dolphins, tropical fish, rays and sea turtles when you go diving or snorkeling. When you’re not exploring the coral reefs off the shores, rent a luxury yacht and cruise to the underwater caves near the Marieta Islands. Punta Mita is the most beautiful seascape town to travel in Mexico for surfing and fishing. Whether you are a pro at “hanging ten” or a surfing beginner, the best waves are here off the coast. La Lancha and El Faro offer experienced fishers the chance to test their skills and show them off while beginners can enhance their skills at El Anclote. Surfers looking for their once-in-a-lifetime paradise can look no further. It is here at Punta Mita. This impressive part of Mexico is known for its natural beauty, making it the perfect place for a spiritual renewal experience. When you stay at one of these Casas, you will be able to relax, rest, reflect, renew and be at peace.Idyllically situated on the heartbreakingly blue waters of the Pacific, Casa Querencia is a stunning five bedroom luxury rental villa that will leave you breathless. Designed by Jaime Bara, the world famous architect brought his characteristic eye for sweeping spaces and modern contours to a new level in this home. Guests of Casa Querencia can expect full access to the renowned Resident’s Beach Club, where R&R is at the top of the menu. This masterfully designed, tastefully appointed home oozes authentic Mexican luxury from the lush private terraces to the locally handcrafted furnishings. Los Cabos was once a virtually unknown fishing village on the tip of Baha California. It has grown to become one of the most famous tourist destinations in the world and Mexico. Known for celebrity sightings, unparalleled snorkeling, sunning opportunities, and party galore, there’s no wonder that it seems like a continual party. The restaurants in Los Cabos offer you the chance to bring in your catch so that they can grill for you. When you’re not enjoying the tasty food, you can get away from the tourist crowd and go shopping in quaint, little art towns, surfing in pristine secluded beaches, visiting nature’s most scenic deserts or diving in coral reefs in the Sea of Cortez. If you are looking for a good time in a city that has a lively party scene and animated scenery, a must-visit is the Cabo Wabo Cantina. Owned by Sammy Hagar, this gigantic complex has massive stages where bands play and bars where you can get a drink…or a few. Some of the most revered legends of the Rock n’ Roll world come here to perform or just hang out. Without a doubt, this is the undefeated party paradise. If you are looking for a week of non-stop fun on your vacation, this is the place for you. This is what attracts celebrities, college students on spring break, and those looking to have the ultimate party experience. It features live entertainment and music every day, food, alcoholic beverages and a functioning rooftop. In El Arco, you can go nature watching or hop on a panga to see the Three Friars, the most famous natural feature in Los Cabos. On one side, you have the majestic Pacific Ocean. On the other side is the Sea of Cortez. This is a great place to spot sea lions and pelicans. Nature lovers will want to make El Arco a priority on their itineraries; it is a town filled with the perfect mix of wildlife and sea. Imagine a cobalt blue swimming pool that seems to melt into the rolling waters of the Pacific. Imagine a magnificent villa so unobtrusively designed that it appears as though the landscape immaculately conceived it. Imagine crisp white curtains, a ceaseless sea breeze, private chefs, and vivid, five-star dining experiences. With Casa Fryzer, you don’t have to imagine. Enjoy unforgettable evenings in the rotunda-style living room, or outside on the pool deck surrounded by the Palmilla hills. Isla Mujeres is a small island just off the coast of Cancun. This beautiful place offers an abundance of nature. There are many awe-inspiring man-made and natural attractions here. You can see incredible views of the Caribbean Sea and sunsets that just melt down into the land below. Downtown, you will find cozy restaurants and hotels. You can also visit the Garrafon Natural Reef Park. This park is one of the only places in Mexico where you can see natural marine life. You can relax in a hammock, hike the trails, snorkel and swim with the dolphins. Before the day is over, lunch and dinner will be calling. You won’t have to go far. The eco-park has that, too. 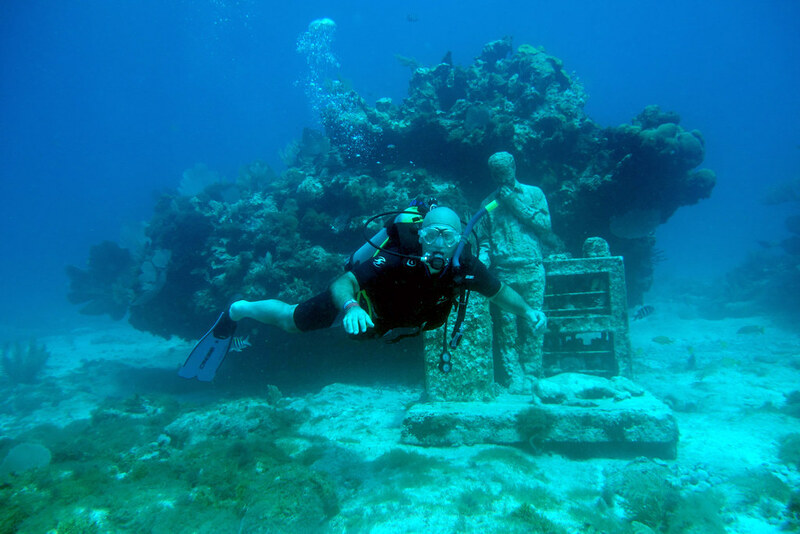 Another attraction on Isla Mujeres is the Underwater Sculpture Park created by Jason deCaires Taylor, which was designed to deter tourists from visiting, and potentially damaging, delicate natural reefs. You don’t have to be a professional snorkeler to be awed by these life-sized sculptures. It is one of the largest underwater amusements the world has to offer, and it continues to grow. New sculptures are frequently added to the already quite popular ones, like The Dream Collector, that features bottles containing messages from people from all walks of life and locations, or Man on Fire, that is covered in a species of coral reef that are brown, yellow, and orange. If you touch them, you will experience burning or stinging that is as painful as a real burn, which is where its name comes from. The park offers many more sculptures that have garnered international attention and fame.The Isla Mujeres is a snorkeling haven, with an amazing underwater world that has a vast array of tropical fish. Contoy National Park is located 45 minutes north of Isla Mujeres. Uninhabited by humans, this natural, protected area, and animal reserve features rare species of turtles as well as hundreds of colonies of cranes, pelicans, and frigates. Since it is protected from all human contact, these species are free to use the island as their mating and breeding grounds safely.Isla Mujeres is known for being highly supportive of the arts as well as education and advancement of youth. Talent and fashion shows are frequently held. It is a mystical island where you can enjoy nature and all its glory as well as arts and culture. Unlike Los Cabos or Playa Del Carmen, the island does not offer much on the party front. Despite that, the outdoor gallery and Mayan cultural programs draw hundreds of visitors to the island every year.Uniquely designed by Javier Munoz Menedez to be completely column-free, the Villa de la Vida in Isla Mujeres offers a real one-of-a-kind experience. Start Your Mexican Adventure Today! Whether you yearn for places that are calm and serene or those that are wild with waves crashing against mighty rock-faces, you’ll find what you long for in beautiful Mexico. The quaintly constructed and unique historical landmarks add to the lush natural scenery and enhance the fascinating Mexican culture. You will savor the authentic cuisine found in these towns; it is unique and phenomenally prepared. Enhance your stay by choosing one of the luxury villas in Mexico offered by Time & Place; these accommodations will set the stage in the best places to travel in Mexico for the vacation of a lifetime. Small and intimate, grand and large or something in between; you can find it in the lovely villas and homes nestled on the warm sands in the most beautiful cities in Mexico.